Sometimes it's a small world. Since-he-read-my-blog, new found Italian cycling friend from Verona, Alessandro, was curious as well about the Mario Confente story. He in turn spoke to one of his cycling friends, Francesco, and incredibly, Francesco, knew Confente. Not only that, Francesco's wife, Ilia, grew up next door to Mario and his sisters in Montorio. Through Francesco and Ilia arrangements were made to meet Gianna Confente on Thursday, March 27, 2008. The four of us went to Gianna's home where we were very warmly received. I brought along most of the Confente materials that are available on the web, and photographs from the CR list (http://www.classicrendezvous.com/USA/Confente_Mario.htm). Gianna was very grateful, and was more than gracious in sharing the information she had about her brother. She had many old newspaper articles about Mario's racing career and frame building, and many, many photographs (some recently received). There was a tremendous amount of information in the albums, too much to digest in a relatively short time. I explained carefully, and with the help of Alessandro speaking in Italian, the esteem in which Mario's work is held. I believe that Gianna, although having an understanding of it before, now has a much better appreciation of how highly Mario's work is regarded. Mario Confente's story is far less, very far less, known within Montorio and Verona (they are adjacent) than it is in the United States. In fact, neither Francesco or Ilia were aware, until this evening, of the details of Mario's work in California. As you can imagine, there were times during the course of the evening, that Gianna was quite moved by the discussion. It wouldn't have been appropriate for me to act like an investigative reporter. -the original family home and frame building workspace was demolished in the 1970s. -the second, and larger workshop in Montorio was located at 19, via Olive. The apartment above the Confente workshop is still there but the workshop area has been converted in garages. Gianna owns Mario's workbench from this shop (her husband and son have used it through the years so things have been added, etc). -Mario's cycling accident resulted in a hematoma, which later caused a more serious medical condition requiring surgery. At that point in his life all of his sister's were married and it was because of his accident, plus the need of greater income that his father suggested that he focus full time on frame building. Gianna said that despite this Mario did continue racing for awhile. Gianna also displayed a letter of invitation from the Italian Olympic Committee inviting Mario to tryouts for the national team. -Gianna knew nothing of Mario having ever made crosses for the Vatican. However, he did do repair work for the local parish priest in the church in Montorio; if he ever made any crosses it would have been for the parish priest. Late into the evening, Gianna brought this out; it was very moving. It was suggested she save it as a family heirloom. The photograph to her right is the last one she received from Mario. Three hours passed very quickly. It was a beautiful evening that will be long remembered. Sincere thanks to Gianna Confente, Alessandro (standing), Francesco and Ilia for making it possible. "Mario Confente has gained international recognition as the master frame builder with the Masi Bicycle Company in Italy and, more recently, in the United States. He is now designing and manufacturing custom bicycles under his own name. A Division of Rexart Cyclery of Jersey City, N.J., the Confente bicycle operation is housed in a new, specially designed plant in Los Angeles. Made-to-order road and track bicycles are produced in the plant. Confente is believed to have produced more professional bicycles than any frame builder in the United States. After serving an apprenticeship with Bianchi, a widely known bicycle company in Italy, he joined Masi. Here his skills matured to the point that he became known as the craftsman of champions. During a seven-year period when he was master frame builder for Masi he produced about 1,700 bicycles. Many of them were ridden by winners of national and international races including such events as the Tour de France. 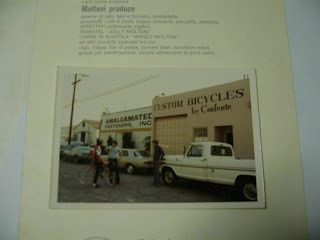 In 1972, Confente came to the United States with Faliero Masi to establish Masi-U.S.A., he supervised production of more than 2,000 bicycles. As his fame as an expert frame builder grew among experienced racers in the U.S., he was frequently asked to design custom-order bicycles. Responding to that demand, Confente joined in an enterprise with Rexart in 1976. Within a few short months, nationally known U.S. racers such as Jerry Ash, Skip Cutting and Xavier Miranda began riding Confente machines. Confente has developed a number of technological innovations for his new plant. Among the equipment he has designed for the plant are specially fit and case-hardened steel jigs to assemble and join both road and track frames. Used to hold the frame angles and tube lengths to exceptionally close tolerances, the jigs assure production exactly according to the designated geometry of each frame. This results in frames that can be said to have excellent geometry. Simply stated, excellent geometry in a custom frame means not only that the frame is absolutely straight, that the tubes, stays, and fork achieve exactly the desired angles; but that such lengths and angles are those required for the specific rider for whom the bicycle is custom-designed. After a frame configuration has been determined, the first step in manufacturing is to cut the tubing to the desired size. These tubes are then fit to specially designed investment cast lugs, bottom bracket and crown before being shaped to the desired angles. Special attention is given to joining the tubes, stays, and lugs. Confente has developed a particularly precise method of brazing to insure that all components are joined with no pin holes or voids that could lead to possible failure under extremely demanding service. The key to the Confente brazing technique is using a temperature that is just below the melting point of the steel in order to not damage, distort, or crystallize the tubing by subjecting its molecular structure to too much heat, thus weakening the metal. A pure brass brazing technique is used rather than a brazing alloy since this procedure results in the strongest joints-another critically important characteristic of high quality frame building. A special flux, developed by Confente to insure proper wetting (brazing) of all joints, is used. After the frame is assembled, sandblasted, and carefully inspected, it receives a pre-painting acid bath. This operation removes all impurities and oxides from the surface of the steel. In addition, the acid bath insures that all the flux remaining would eventually permit a corrosive action to take place. The acid bath is followed by an oven drying procedure. Then two baked-on coats of primer are applied. This step is followed by two applications of primary color., both of which are are also thermal cured. The decals are then applied and, as a final step, the frame is given two coats coats of clear lacquer. Confente uses a special acrylic paint because it provided a much harder surface than epoxy or urethane-based paints that do not stand up under demanding service conditions of racing without wearing, chipping, or corroding. Just prior to the painting operation, the front and rear drop-outs and fork crown are sometimes plated with a tri-metal combination of copper, nickel, and chrome to prevent rusting. These parts are masked during painting operations. Only the finest components are used for Confente bicycles-Fully Campagnolo equipped; Cinelli handlebars, stem and saddle; Clement silk tires; Regina freewheel and chain; and, of course, either Reynolds or Columbus tubing. Confente frames are produced in all types of Columbus and Reynolds tubing. Because each bicycle is individually fabricated, it is possible to mix Columbus and Reynolds main tubes and stays according to customer preferences. For customers who are unable to come to the Los Angeles plant, Confente has developed a special skeletal form of the human body. Its use insures that the frame size and all other design parameters conform exactly to the customer's height, leg length, arm extension, waist attitude in the down position, length from seat post to stem and all other critical variables involved in custom frame design." Note: a fully equipped Confente cost $995 in 1976. The next blog entry will be about my very interesting visit with Mario Confente's sister, Gianna Confente. There was a gentleman by the name of Giuseppe Ottusi in Milan, considered "the master" in saddle modifications. He would purchase saddles, such as a Brooks saddle, and modify them. This work would would often be carried out for professional riders. 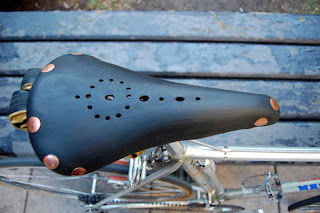 The modifications would include shaping the saddle, making it softer, making it more breathable, and changing the height of the saddle (to rails). 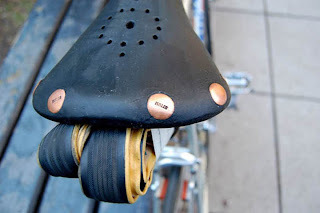 The costs of the modifications typically exceeded the cost of the saddle. 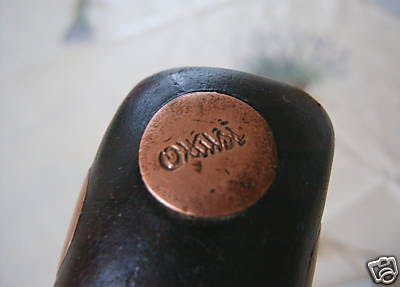 Ottusi modified saddles have his name stamped in one or two rivets. While Ottusi was considered "the" master in Milan, the last of these craftsman was Giorgio Siligardi of Vignola. They are relatively rare and are sought out by collectors for their bicycle restoration projects. If anyone has more information about either of these saddles please leave a comment. The "Palio del Recioto" is a very important U23 international race held in the heart of the Valpolicella region. It's always held on the day after Pasquetta (which is the day after Easter) and today was the 47th edition of the race. Previous winners include Francesco Moser (winner 1970), Giovanni Battaglin (1971), Roberto Visentini (1975), Dimitri Konychev (1987), Alessandro Bertolini (1992 and 1993, the only two time winner), Mirko Celestino (1995), Fabian Cancellara (2000) and Yaroslav Popovych (2001). This year there were 33 teams (maximum of 6 riders) representing Italy, England, Austria, Australia, Russia, Switzerland, Yugoslavia, Croatia and Spain. A brisk morning, with a low of -1C, turned into a beautiful day. I'm sure the riders were pleased that the 133 kms would be run under perfect weather. I decided to wear a Stars and Stripes jersey as many know me as "il americano". Arriving in Negrar I first ran into Francesco Moser. Moser's lasting accomplishment was in 1984 when he broke the 1972 Hour record of Eddy Merckx. In 1984 he also also won Milan-San Remo and the Giro d'Italia. Among his other victories are 3 consecutive Paris-Roubaix, and Road World Champion. Saturday's cool morning turned quickly into a beautiful Spring day. 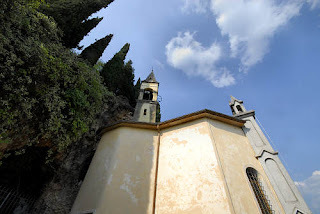 The club's ride took us on some of the roads of the "Strada del Vino Valpolicella" and included a visit to the Santuario della Madonna de La Salette in Fumane. This was to be followed by a not so difficult climb of the "Pendola". Brent was visiting once again in Verona with his versatile Hampsten Ti S&S coupled bike. We wound our way from Verona to Fumane on some nice back roads of the Strada. It's a short climb to the Santuario della Madonna de La Salette which is built into the edge of a hillside. There is a small, scenic point above the church where I took this photo of Barbara, Brent and Ester. My granfondo buddy, Paolo, was riding a new acquired steel Fontana "training" bike; his high zoot ultralight carbon bike has been giving him fits of high speed shimmy on descents. Brent, Paolo and I split off from the club ride as I wanted to take them on a newly discovered climb. This climb begins at the last switchback before you reach the Santuario, the road resembles a private road because it's so narrow. From here the climb is approximately 5 Km in a world of absolute silence. Tuesday is the U23 Palio di Recioto race, one of the most important U23 races in Italy. At the last race I had a chance to chat with Rasmussen for about half an hour and, as always happens, I didn't have my camera with me. Rasmussen lives in Lazise on Lake Garda and I see him from time to time on the roads but there is rarely a chance for a chat. Next, was a top at a bike shop I didn't know existed. Of all the crazy things they had a Chris Boardman LOOK time trial frame with a full Mavic Mektronic system that he had used in a Veneto region time trial event. They also had a small display of Pantani signed jerseys and memorabilia. Another day in cycling paradise. 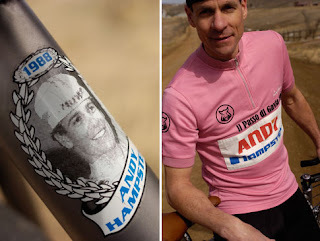 To celebrate the 20th anniversary of possibly the bravest ride in Grand Tour history, Rapha (http://www.rapha.cc/) is offering the Andy Hampsten Passo di Gavia jersey. 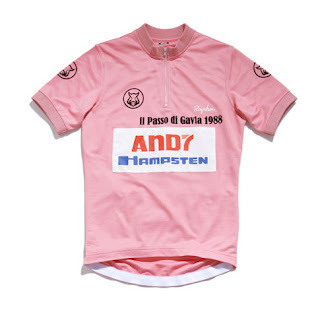 This limited edition item is a replica of the Maglia Rosa Hampsten won in 1988 after he devastated a field of near-frozen Giro d'Italia riders over the snow covered Gavia Pass. The Andy Hampsten Sportwool™ jersey features a classic rib collar, zipper and cuff details and a collectors race number '172' complete with safety pins for attachment. 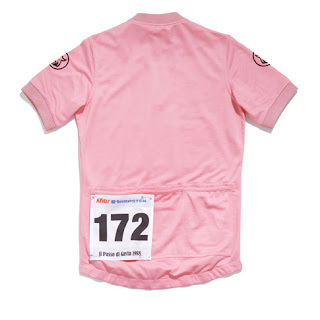 It's not cheap: £120.00 $205.00 €180.00 and can be purchased online at the rapha website. Do note that Andy looks very fit! We were about 400-500 meters above sea level, in this big valley in Lombardy… and it was snowing. Most of us on the 7-Eleven team were from Colorado, and were pretty good at math, and if it’s snowing and you go up… and it’s SNOWING… it’s slushy, it’s coming down and then melting, it’s belting in… There’s no hint of anything changing, looking at the weather forecast. So the Giro organizers held an emergency meeting with all the team managers, telling them “hey, we’re doing the race, the roads open, snowplows are keeping it clear. 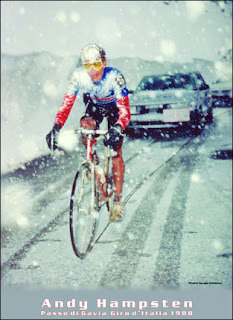 It’s not icy on the Gavia, but it is snowing.”When we left it was just raining… kind of sleet-rain, but bucketing down. We went over the Aprica pass, a category 2 with a pretty short descent, but even on that descent I was wearing ALL the warm clothes I could possibly put on. I was shaking uncontrollably on that silly little descent. Then we were up at about 800 meters (altitude) climbing on a long false flat. A break went away and my team was chasing it but we weren’t going too hard, there wasn’t anyone really dangerous up there.And everyone was freaked out. All the racers were just… “scared”. The roads were wet, we’re just getting soaked to the skin. The cloud cover’s really low, it’s belting down on us, it’s really thick clouds, sometimes it’s foggy, sometimes we’re just below the clouds. We just kno-o-o-w it’s gonna be incredibly cold.Andy’s voice lifts for a moment when he remembers “My team was taking really good care of me bringing me hot tea every 5 km, we had a big thermos, our team was really well prepared. They’re asking “Andy – should we chase that break? Should we catch ‘em before the mountains?” But we just did tempo, I think Chiocciolli’s team with the leaders jerseys did a moderate tempo as well. We went through the town of Ponte di Legno, across the wooden bridge, then we turned left towards the Gavia. It’s a gradual climb for about 4km, things are stringing out a little bit but there’s quite a bit of talk amongst (primarily) Italians… about ‘hey, let’s have a little strike, let’s not really race it, let’s get in the cars, let’s just go home’…And someone says: ‘hey Andy, you’re not gonna attack are you?’I just looked at him… and I didn’t say… a word....they knew damn well I was going to attack. The road was still paved, but after a couple of km it turns to dirt. My team doctor - Dr. Massimo Testa – who’s from Como and knew the roads really well told me it would go around a left hand turn, still paved, then narrow to one lane under a grove of fir trees, and it’ll be 16%, right away, and turn to dirt. Wood Rims: Where To Get Them? Admit it, those photos of the early 1950s Gino Bartali with the wood rims had the wheels turning (!) in your head, "I have to have a pair of those." Where do you get them? From an Italian company, of course. 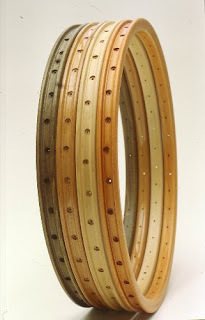 Cerchi Ghisallo "has been operating with success in the wooden bicycle rims business for well on three generations now. Founded in the 1940s together with Antonio Cermenati and strengthened by the cooperation with the D’Alessandro company (renown for their tubular rim production), affirmation both in our homeland and abroad was quick to come. 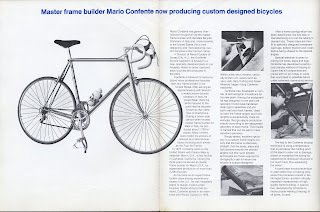 In 1976 the business was taken over by the founder’s son Giovanni, who went on to operate a major breakthrough with the leading technological company MOMO DESIGN, by securing the supply of wooden rims for an exclusive custom designed bicycle. From then onwards a great deal of articles featured in both specialised and non-specialised magazine editions describe the production processes and implementation of wooden rims, further to film documentary production both in Italy and abroad describing how resilient and strong wooden rims are. Not only do they equal those in metal, but they feature a much greater elasticity over the rougher and particularly longer routes, with the added benefit that on downhill stretches the infamous inconveniencies of overheating due to brake friction pads are avoided, thereby guaranteeing optimised braking performance at all times. Our catalogue proudly quotes the following comment by Fiorenzo Magni: ”Not only has my good friend Giovanni continued a wonderful tradition, but he has managed to give his rims that special touch that is the absolute best that a cyclist can find. By the way, I won the Tour of Flanders three times running, using these wooden rims”. In 2003, the business was taken over by Giovanni’s son, Antonio: the third generation devoted to continuing the “CERCHI GHISALLO” wooden rims traditions. Production craftsmanship processes are entirely hand controlled, from the actual woodblocks to the end of the various work process cycles." See http://www.cerchiinlegnoghisallo.com/homeeng.php for more details and contact information. 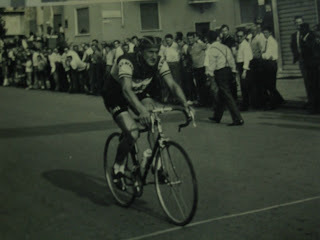 Here is a photograph (from the Aldo Ross collection) of Magni riding in the Tour of Flanders in 1951. I've been very impressed with the committment of the officers and members of the club to organize the annual one week tour, traditionally occurring in June. It's a labor of love, from choosing the locale, route planning, hotel reservations, dinner arrangements, managing the finances, etc. This tradition began from the first year of the club's creation in 1982. The 1985 tour had to be the most unique when 11 club members cycled from Verona to the Vatican for an audience with Pope John. The club ride planned for this past Sunday was a visit to Castellaro Lagusello followed by a visit to Madonna della Scoperto. Unfortunately, the weather was not cooperating, once again, for a Sunday. Despite the threating rain we departed from the club at 0900. We could not reach our planned destination due to rain showers but we managed to get in a nice 80 km ride while missing the rain drops. 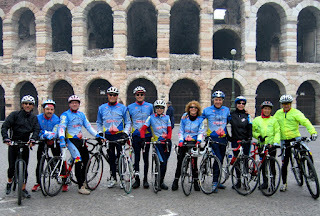 To get more kms in we decided to ride into the historic center of Verona and take some photographs in Piazza Bra where the Roman coliseum is located (and famous for its outdoor operas in the summer, see http://www.arena.it/). While we are taking photographs this very interesting guy arrives in a beautiful, early 1950s, Gino Bartali with a Simplex shifting system and wood rims. It was a gem. It's the bike he rides in the L'Eroica (www.eroica.it/eroicae.htm ) each year. After the picture taking we rode to the club to have a delicious lunch prepared by Jo. Brava!